For some people, the week leading up to New Year's Day is filled with football. The best teams in the NCAA bring their talents to warm-weather destinations around the country to play against each other for bragging rights and coveted trophies. In the past, there were only a few pageantry-filled, history-rich bowls. Now, there are now dozens of games from mid-December through the New Year. A few time-tested classic bowl games still remain. One of these is San Diego’s Holiday Bowl. This pre-New Year football fest has been held for the past 35 years, with legendary college football programs like Texas, Oregon, California, and BYU taking the field in past years. Like all bowls that have stood the test of time, the Holiday Bowl is about much more than the game itself. A 5K race, events at SeaWorld and the San Diego Zoo, VIP luncheons, and the famous San Diego Big Bay Balloon Parade make this an exciting time of year, even for people who are not fans of college football. 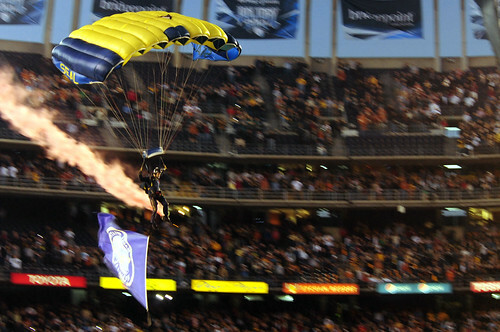 But the game itself, held at Qualcomm Stadium, is the reason that the whole weekend takes place. You can sit in the stands and soak in the atmosphere, or you can purchase a VIP ticket package that includes exclusive seats and access to an invitation-only pre-game event with a buffet, live entertainment, and drinks. If you really want to turn this once-a-year extravaganza into a truly special event, the VIP treatment is the way to go. If you really want to take full advantage of the Holiday Bowl experience, you can attend the exclusive US Bank Kickoff Luncheon. Players, coaches and ESPN analysts will be on hand to discuss the game during a multi-course meal. 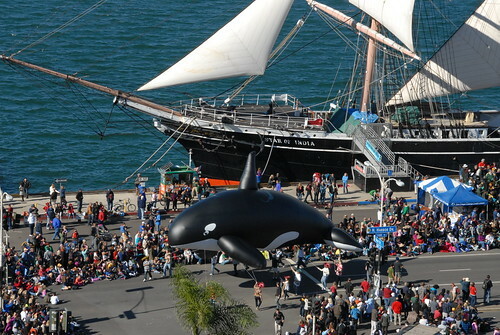 You can also mingle with the teams during their trips to the San Diego Zoo and SeaWorld. On game day, the Port of San Diego Big Bay Balloon Parade will draw 100,000 spectators and be broadcast on television to a nationwide audience. This is the largest helium-balloon parade in the country, and it really captures the tradition and pageantry that makes historic games like the Holiday Bowl stand out above all the newer bowl games. Because this event is such a bowl-season stand-out and because this is a time of year when everyone is in a celebratory mood, the Holiday Bowl is the perfect back-drop for your own special event. Our exclusive estates can provide the ideal setting for a pre-game party, a private luncheon, or an upscale soiree before or after the game. The Helix 360 Rotating Home offers something that is usually only found on a few five-star hotels' rooftops: a rotating space that provides 360-degree views of the surrounding landscapes. From its location on the top of Mount Helix, guests can see all of San Diego. This venue is a perfect and utterly unique luncheon spot, with seating for 50 guests. Its central location and onsite catering and event staff make the Helix a great choice for a pre-game event. For a post-game evening event or a post-parade cocktail party, the La Jolla Modern Estate is a great choice. The venue can host 50 seated guests, or provide space for more than 100 for a cocktail party. Since it is located in one of the most affluent suburbs on the West Coast, the La Jolla Modern will give your event a truly exclusive feel. The sleek modern design, oceanfront views and airy open spaces at this estate will certainly make yours one of the most memorable events of Holiday Bowl weekend for anyone who decides to attend. For a larger corporate event, Las Olivas, a Tuscan-style estate in Rancho Santa Fe, will be in the highest demand. The manicured two-acre grounds and the spacious home, which has overnight accommodations for your most-special guests, can host up to 50 people. With terraces, water-falls, gardens, and an amazing al-fresco atmosphere, this is the perfect venue for someone who wants to go all out and host a truly spectacular and luxurious event. You can find other California event estates on our special California estate page. You can also browse our nationwide listings, including estates in locations where other bowl games are being held this year, on our main web site. Are you looking forward to the college football bowl season? Will you be attending the Holiday Bowl? What other games will you buy tickets for? Let us know in the comments section below.